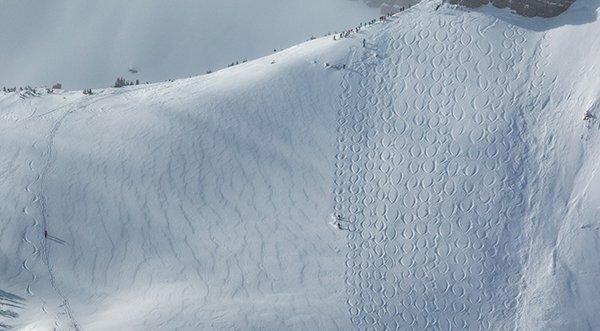 Teton Village, WY – Last winter, Jackson Hole Mountain Resort (JHMR) brought back the Powder 8 competition after a 15-year hiatus as part of the Wyoming ski resort’s 50th Anniversary programming. The competition was so well received, JHMR will now once again make the event an annual tradition. This year the invitational team contest will host approximately 22 teams invited from a variety of western resorts, with over $10,000 in cash and prizes for the top three finishing teams. Three judges will be ranking teams based on historical requirements, including style, symmetry and synchronization. The Grand National Powder 8 Competition will be held on the Powder 8 face of Cody Bowl on February 4th, with a backup weather day on Sunday, February 5th. There will be a local qualifier competition on Saturday, January 14th planned to run on the Powder 8 face of Cody Bowl. Registration for the local qualifier is open until noon on Monday, January 9th, and up to 22 teams of two people will be drawn at random from the pool of applications. To sign up and for more details on the local qualifier visit: www.jacksonhole.com/events/events_cat/powder-8-s-local-s-qualifier.16721.html.